On the subject of Russian River, sensational brews, and otherwise blurry memories from the City of Brotherly Love, the Baron would be remiss not to recount two Philly favorites. As Brother Barley aptly summarized, Russian River is a gem. For years this daft bon vivant has sought out the joys of a Pliny or a Pig only to be thwarted by the fairly limited distribution aparatus employed by our heroes out in Santa Rosa. It was, therefore, with considerable enthusiasm that I cracked into two truly stellar Russian River offerings: Supplication and Damnation. Supplication is a Brown Ale aged in French oak Pinot Noir barrels. At 7% ABV, this complex delicacy derives its outstanding character from multiple strains of “critters” – brettanomyces, lactobacillus, and pediococcus – along with a handful of sour cherries for good measure. Against the dungenous backdrop of Monk’s Cafe, the color was difficult to discern, but the brew stood tall with tart notes of fruit, oaky spice, and funky, earthy goodness. Tart cherries and oak danced bubbly on the tongue as a sour draw gave way to a bitter, fruity finish: a marvelously balanced and delicious gift. To Russian River goes 4 hops and the heartfelt supplication of earnest lads back east who are thirsty for more. 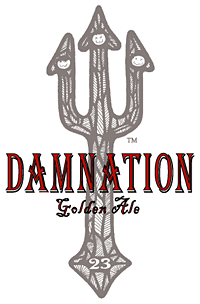 Damnation, a Belgian style Strong Golden Ale, filled an essential void amidst the din of an afternoon session at Eulogy. At 7.75% ABV, this crispy offering poured like rays of golden sunshine with bands of scattered stratocumulus drifting lazily beneath a pure cotton head. Grassy and bitter, the nose quickly gave way to fascinating flavors of banana, pear, and clove. Though out-classed by its humble cousin, Supplication, the brew was nevertheless quite fine. Inspired, I cried mightily with a strong voice, saying, “Babylon the great is fallen, is fallen,” dubbed the diabolical drink 3 hops, and downed the beast as the hours waned, our constitutions loosened, and our humble drinking hole became the habitation of devils, and the hold of every foul spirit and a cage of every unclean and hateful bird. Or something like that. We’d all had a lot to drink. Thanks, Russian River, for proving yourselves every bit as worthy as promised. Although your ales are not yet available in the home of the bean and the cod, I sit at this moment sipping a Monk’s Cafe Flemish Sour Red and dreaming of the next time we may meet. Ici chacun sait ce qu’il veut, ce qu’il fait, quand il passe! Posted in Uncategorized.Tagged Apocalypse, Chant des Partisans, Damnation, Philadelphia, Revelation, Russian River, Supplication. See…now you’re just adding insult to injury for Doc. We sampled a bunch of Russian River brews in Philly, yet Doc can’t remember a single one. He really needs to kick his laudanum addiction. Love the Supplication. I probably like the Damnation a touch more than you, but I agree it doesn’t compare to RR’s best work. Thankfully the good Doctor still had his bearings when he tucked into RR’s Damnation at Eulogy. Enjoyed ever damn bit of that brew. I remember ordering the Supplication and even remember enjoying it, but after reading Sudsy’s description I’m starting to doubt my own recollections. Bret and cherries sure are news to me.